Are you one of those who can't fall asleep without their favourite TV show on in the background? 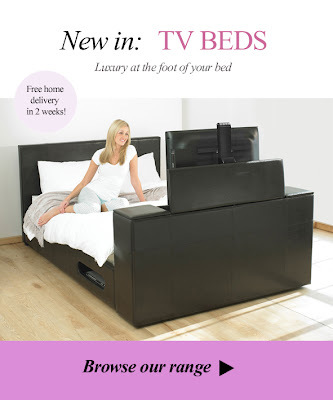 If so, then check out our brand new range of beds with a specially designed hidden TV section at the foot. If you're a sucker for luxury, these pieces of furniture are the perfect treat. TV beds are ideal for lazy mornings when it's warmer inside than out. Plus, for your convenience, a selection of these beds are available with an included mattress to make it less of a hassle to buy your ideal bed package. Pin It Now!